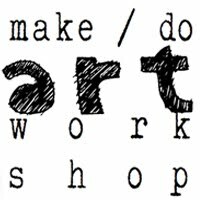 It has been quite the busy week here full of all kinds of creating. 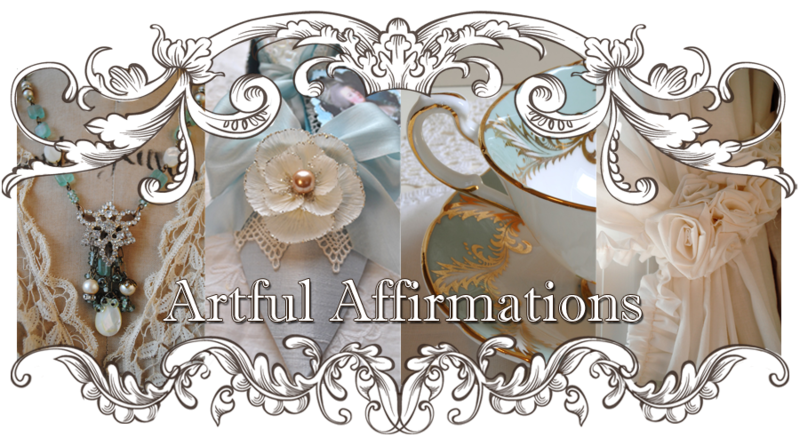 My last post was a Mad Tea Party blog hop hosted by Vanessa at A Fanciful Twist. You may find it enjoyable to read and to see the whimsical table my daughter and I set. I even made the Mad Hatter's hat. I will share that in another post. But today is for tea cups...so on we go to this weeks beauty! Above you see one of my cups that I think is unique....at least a little. Also, I am showing off a bit of vintage lace that I think has such a fab color of gray/green. I know it looks a bit ratty, but I really love the color and texture as well as pattern. This is one of the first tea cups I bought about 18 years ago. I found it at an estate sale on my street. I was new to the neighborhood, and did not know the woman who passed on...only knew her to wave to as we walked by. When I went into her house for the sale, I was overwhelmed with a feeling of joy! The entire house felt so good, and I was sure this was the energy of the woman who lived there. So when I spotted this cup, it was like bringing home a treasure from a friends house! I brought home many items from that sale, and I really feel they have added to the joy in my home. I love the gold trim. And I think it was only $5! The flower is so pretty and seems to just flow around the cup. The leaves are an interesting shape as well. I remember thinking what an odd shape for a handle....bat like even! I thought the scalloped edge and the eyelets were beautiful. This cup sits on a pedestal that also has eyelets. Don't laugh, but I do not recognize this stamp! Is it HR or HHR? I bet some of you know the maker. I covered this paper mache egg with a tissue paper transfer I created from an old French legal paper from the mid 1860s. I am still deciding what else I could do to it. 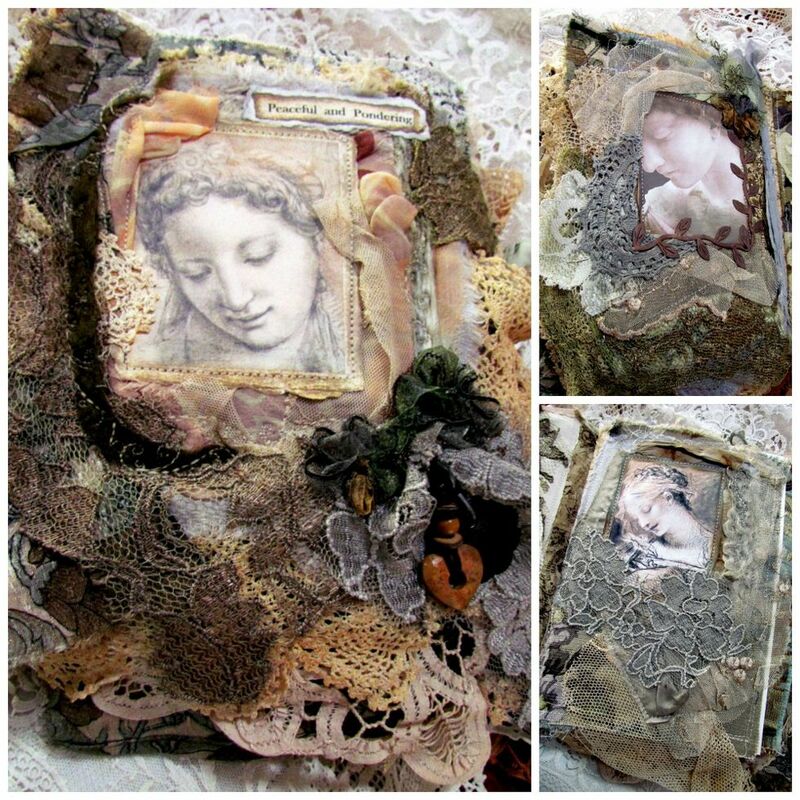 You can view my newest free video on Tissue Paper Transfers by clicking on this LINK or going up the right hand side of my blog at the top and clicking on the picture of the tissue transfers. And here below is my next and last gift to win for my Happy June Giveaway! This French inspired Domino book! You only need be a follower to enter, just leave a comment to this post and let me know you would like to enter. Only two more days until I pick the winners for each of the 5 prizes! If you have not yet signed up for any of the other prizes click HERE for a link to a post that lists them all. This really has been a Happy June! 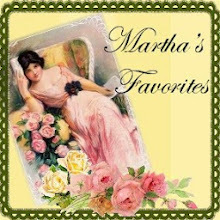 I am so thankful for each of you who stop by, and I am appreciate your comments so much! As I have said before, I wish I had a present for each and everyone of you. If you want to join in Tea Cup Tuesday. Just go and create a post with your tea cup in it, then come back here and link up below. Martha and I love hosting this party because we get to come and see you and your beautiful china. That reallly is a lovely teacup and saucer! 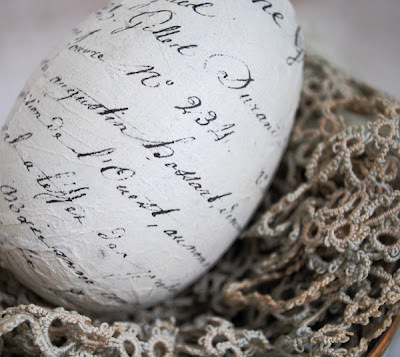 And I love your pretty paper mache egg! The little domino book is adorable! Thank you for the chance to win (I am already a happy follower!). Thank you for hosting and have a wonderful week! Very unique tea cup and I like the story it has. Very cool Alice/ Tea party post. Lots of work went into your tea party! Tenham todos uma excelente terça com chá! Terri...LOVELY cup and your accordion book was amazing...you have endless talents. I love the little eyelets on the cup too. B/c of blogging and your insight I am starting to pay more attention to the marks on the various cups I own and inquire to purchase! Beautiful teacup and I just love what you did to that egg. seems everything you touch is just gorgeous! Yes, Terri - please do enter me for the sweet domino booklet - I love those when you offer them. So clever and themed. My daughter-in-law loves all things french, too! Would love to win! You post was delightful. GOod story about how you came upon your treasure. I love this beutiful cup! And the egg is just gorgeous... and I JUST ADOOOOORE the little dominobook... I join in once again, your made a month of june so gelightful! this cup is wonderful in shape and the rose is so naturally painted. I understand, how good it feels to have this cup from this special women. I am sure she was also happy to sell it to somebody who treasures it. That Paris domino book is amazing.Thank you for sharing your treasures and for hosting this sweet event. Terri, this is a very beautiful post, not only is your giveaway domino book, such a fantastic little gem, I would so love to win---- but also your cup,and the way you photographed it with lace and your beautifully made egg-makes your post gorgeus. Thankyou for filling my morning with beauty,dear. I just adore your gorgeous teacup! I wish I could tell you more about it. Your handmade boxes are so precious. 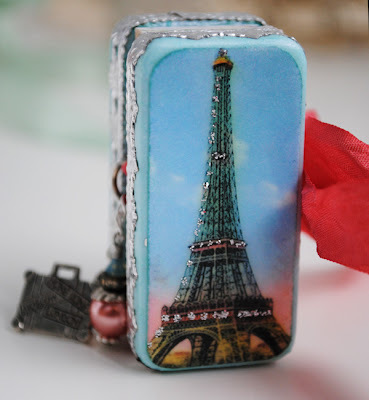 I love the Paris theme with the pretty charm. Thanks for hosting. 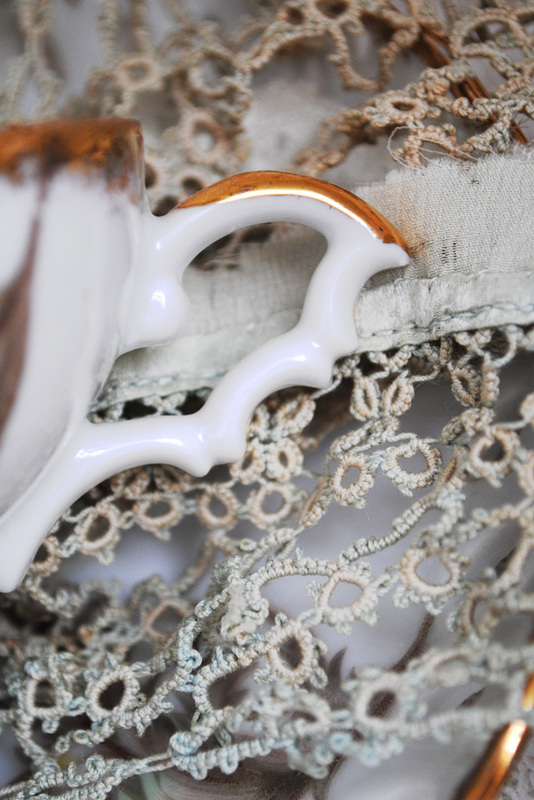 oh my, what a unique and beautiful teacup, i agree that it has a lovely design and texture, the almost like a batlike handle is also interesting, gorgeous! love the little domino book you created, so lovely and i hope i'll win it! :) thank you for sharing and hosting tea time tuesday, have a blessed day! 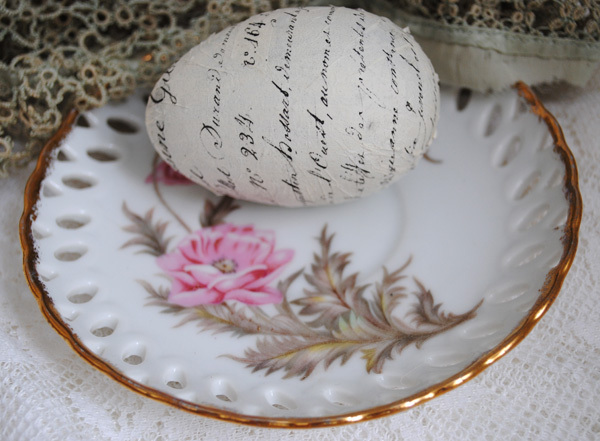 Oh How lovely Terri, I couldn't stop looking at the egg and lace. I would imagine you could decorate the egg like two half's as only you know how. The cup with it's beautiful lacing all of it's own is truly very beautiful I love the leaves on this very much and I really like the feeling you created of the lovely ladies house. The domino book is fabulous! I would love the chance to win it. Thanks! Lovely teacup - and giveaway! I would love to enter!! Drop by for tea today, if you get a chance. Beautiful teacup and a very lovely post. I can't wait to have time to try your tissue paper transfer! 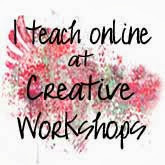 Thank you so much for all your fab tutorials!! Hello, Terri, your teacup is very sweet. I do like the eyelet trim on the cup/saucer, and the delicate flower is so pretty. The handle is quite nicely shaped. I like the story about going into the woman's house and getting a happy feeling. Who wouldn't like that beautiful domino book...your prizes are tip-top! What a beautiful teacup! 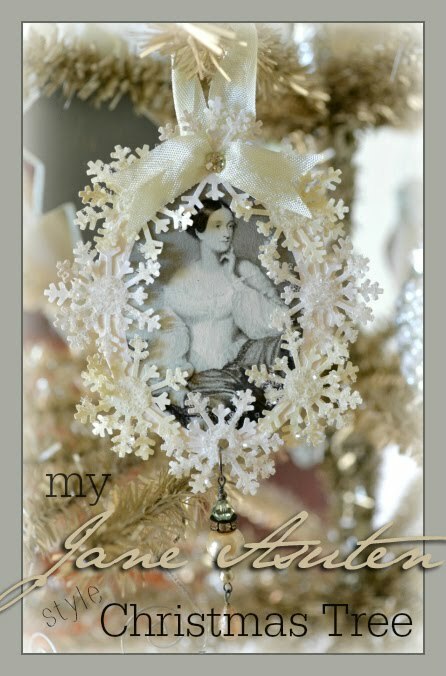 I love your presentation of it too with the old lace and that darling frenchy egg. The domino book is gorgeous and I adore the Eiffel Tower on it! Aqua is one of my favourite colours too so please put my name in on it. 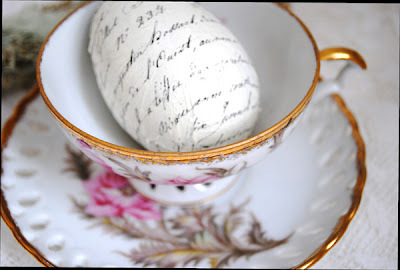 I enjoyed your Mad Hatter Tea post too; very fun and imaginative! Thank you for your lovely post and Happy Tea Day! What a delicate little cup. I love your egg in it. They look so good together. The Paris domino is fabulous. I love the colors you chose for it. thanks for hosting this wonderful giveaway... im keeping my fingers crossed. I ADORE your teacup, Terri. It's so delicate with the cut-outs. And your egg looks at home there, too! Please enter my into your Domino Book give-away. It's so sweet and I'd treasure it always! Love this cup with its interesting handle and eyelets! So pretty. Happy Tea Day! The teacup is just so beautiful - I love the charming handle. Thank you for hosting our tea party! Have a great week! Teri, as ever you have captured joy in a post. The old lace, I believe is a tatted piece. I love the old tatted works especially since tatting is almost a lost art. 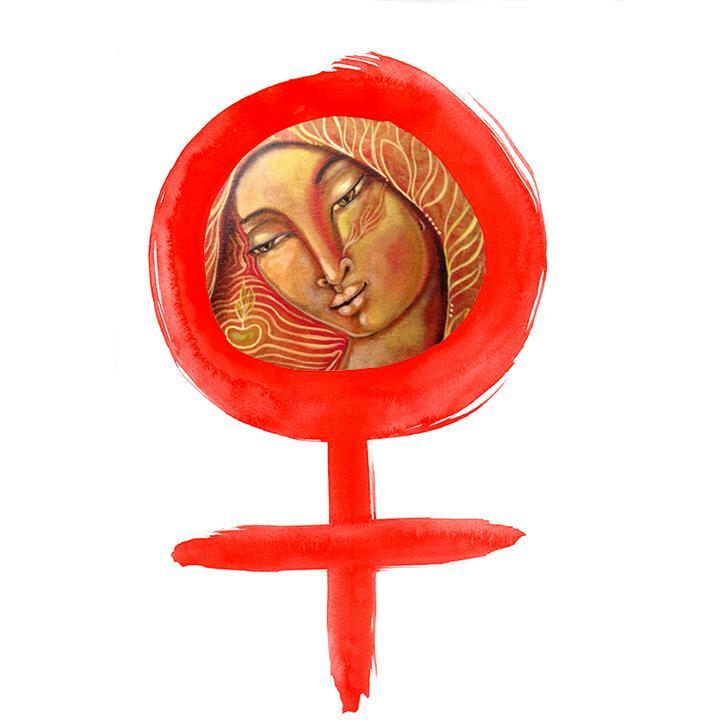 I love the way you described the feeling of how the woman's energy makes her home a place of joy. The teacup is wonderful. 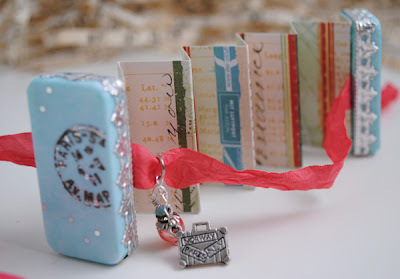 I would love a chance at the Domino Book, and I would love to learn how to make one myself! What a pretty teacup! I love it! 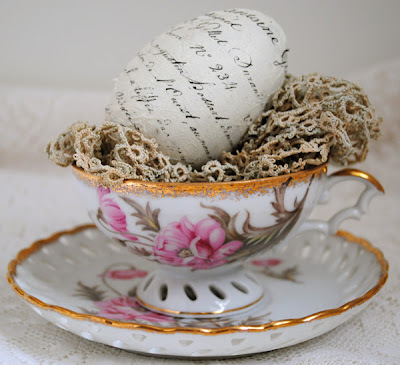 I loved your tea cup and your lovely creations, specially the papier maché egg. Unfotunatelly I wasn't able to link up with this new type you introduced. That is a lovely teacup. The eyelets are so pretty and I don't think I've seen a teacup with eyelets on the foot of the cup, or such a unique handle. Your domino book is great - I love the Eiffel Tower and blue color. I can´t send my link...perhaps I don´t know how do it! The cup and domino are both beautiful. You are so gifted with the art you create with these dominoes. I love the Eiffel Tower. I am participating with a tea strainer. It's a work of art too, I think you will like it. And also with a vintage rhubarb sherbet for a lovely ladies' tea. 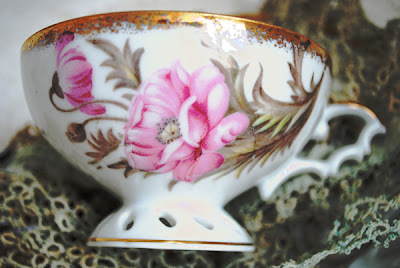 I never met a tea cup I didn't like and have seen some beautiful ones on your blog. The domino book is, like all your art, exceptional. I can't imagine working on something that small. I always enjoy your beautiful teacups and this one with the story of how you acquired it is very special. Yes, please enter me in your Domino book give. 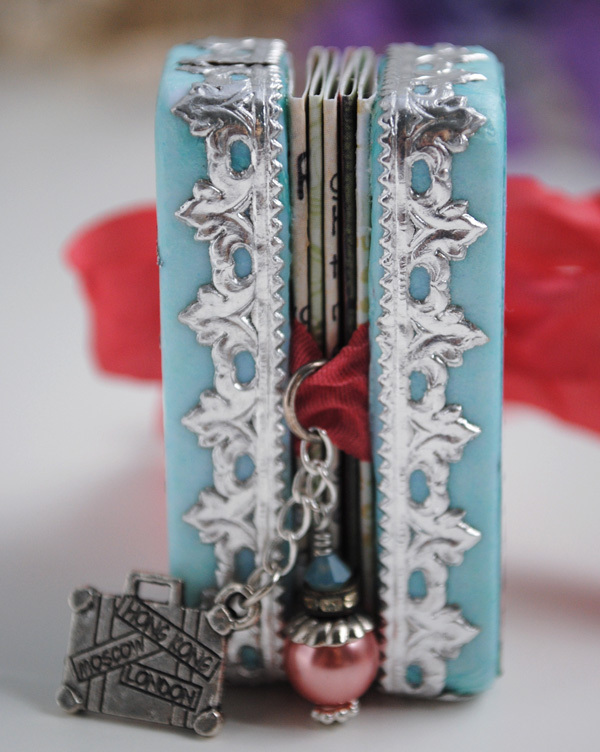 It is charming and so blue tres chic. Your teacups are so beautiful! Oh, please enter me in this wonderful giveaway. 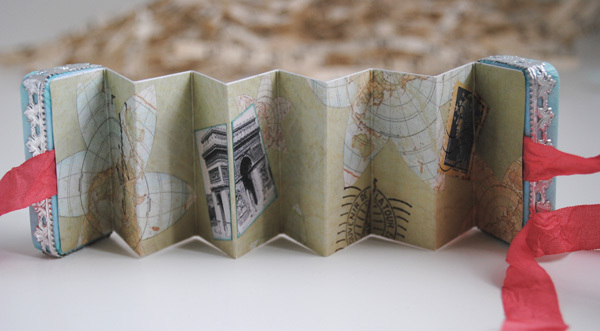 Oh, I love your Paris-inspired domino book so much! Thank you for including me in a chance to win it! What a wonderful teacup set. It is so delicate looking and I really love that handle, very unusual! Your domino book is a dream. Such a lovely piece of art. GORGEOUS! Hi Terri! I adore your teacup. The lace style cutout on bottom and saucer is adorable. The lace is pretty too. I viewed the tea party and mad hatter. That was so imaginative and , my guess, you worked very hard. Totally worth it. Have a great week. Thank you, Terri, for welcoming me to Tea Cup Tuesday! I thoroughly enjoyed it. I am learning so much and love the prettiness. Your eyelet cup is a beauty. I imagine people have all sorts of books to find more out about these things. I loved your egg, too. I made some similar ones. It was perfect, sitting in the sweet cup! Thank you for stopping by my blog, too. When I am new at something, I really appreciate that. You are a dear! Aloha Terri, I love your beautiful teacup and saucer. 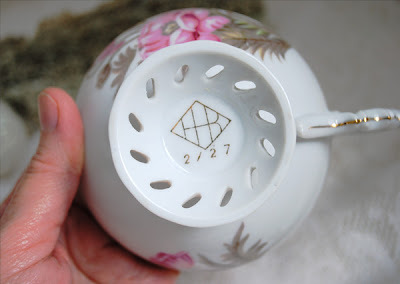 That is a very lovely tatted lace you put with your teacup. And I adore your domino book. I just had to check out your post before this one and I must say, I just fell in love with your entire post, I love Alice In Wonderland. You're so talented! TFS & warm hugs to you. Wow..another beautiful post Terri.....I adore lace..especialy vintage and antique laces...just gorgeous..your photos are magical..the egg is gorgeous! 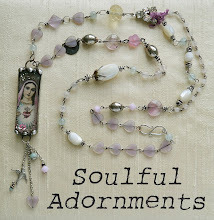 Yay..such a fun post..and such a beautiful creation..wow...how beautiful and enchanting..such talent! Oh Terri, oh Terri, oh Terri! How I LOVE your little domino books. . . so, so sweet! I would treasure anything you made. I have to let you know how much I really enjoy your posts about the teacups and your how-to videos. 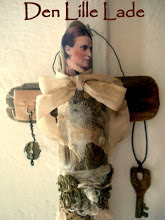 Very nicely done, and I have already followed your directions for the flowers and the banners. Love, love, LOVE your site! I just realized I linked up twice! I'm sorry:( I guess that is what happens when the grandchildren visit for the weekend...I'm a little pooped! I think your teacup is lovely...how special for you to have it to treasure. I'm sure your neighbor would be pleased! what a joy it is to view your artwork. so beautiful. I don't know if I could pick a favorite, but if I had to, it might be the domino book. I love that with each of your treasures is a story. You are lovely and so is your collection! I enjoy it so much and do Thank you. Oh what a sweet little cup! The egg is just an added plus! I absolutely love the little domino book. 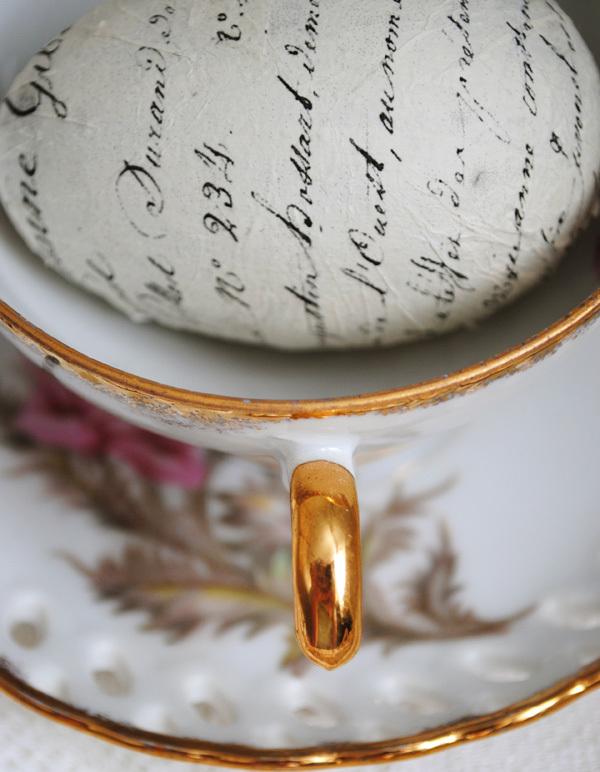 I love your gorgeous teacup and the sweet egg! Your domino book is AMAZING! you are one talented lady! I hope you have a safe and HAPPY 4th of July!